Is it a bullfrog? Or not? There are three species of native frogs on Vancouver Island - none of which are easily mistaken for an American bullfrog. However, there are also two other introduced species who might be mistaken for bullfrogs. 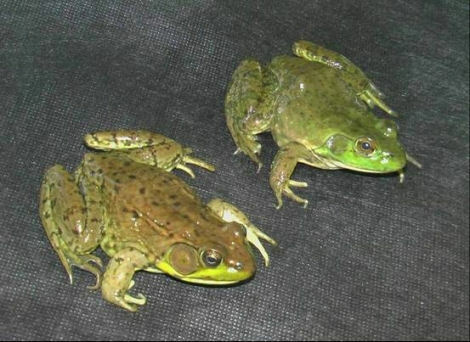 Green Frog (below left) is the species most likely to be confused with a juvenile bullfrog (below right). The Green Frog has ridges on either side of its back that extend from the back of the eye and top of the eardrum along the rim of the back. 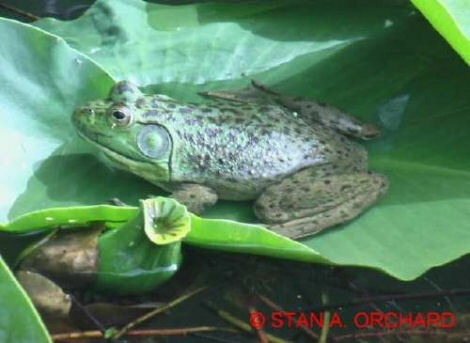 Fully grown green frogs are only about half the length of fully grown bullfrogs. Leopard Frog (below) has a very distinctive spotted pattern and the paired dorso-lateral ridges on its back are conspicuous. Neither of these characteristics is found on bullfrogs. 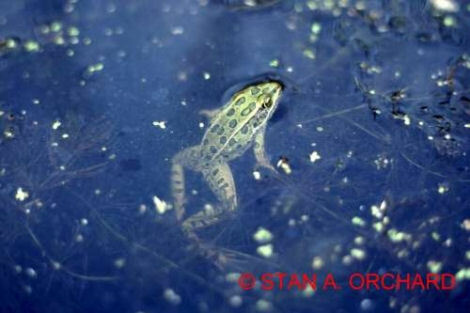 Leopard frogs were common in the East Kootenay region of southeastern British Columbia until their populations crashed in the 1980’s. One population persists just north of Creston. Leopard frogs were introduced onto Vancouver Island many decades ago in the vicinity of Errington near Parksville and the Englishman River on Vancouver Island, but there have been no reported sightings in recent years. 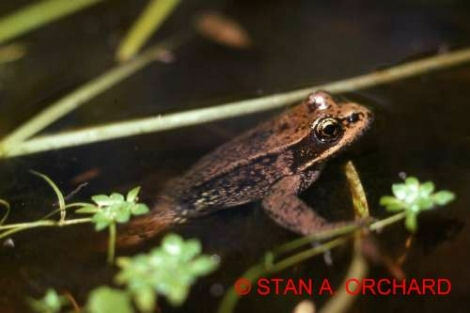 Red-legged Frog (below) is the only native frog that might be mistaken for a bullfrog. However, it has a pair of dorso-lateral ridges on the upper edges of its back, extending from the back of its eye almost to its hind leg. It also generally has a reddish-brown or dark brown colouration and facial mask from its nostral, through the eye, and covering the tympanic membrane of the ear. Pacific Treefrog, a.k.a. 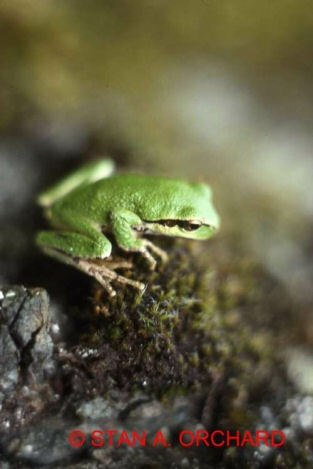 Pacific Chorus Frog, is small, generally green, and with a black mask. The ends of its toes are enlarged to form disc-shaped toe pads. 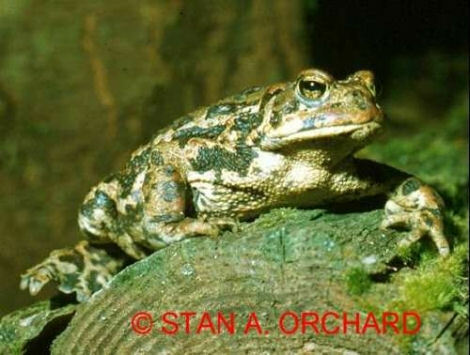 Western Toad (below) is the largest native species on Vancouver Island. It has characteristically warty skin with a pair of conspicuously enlarged glands just behind the eyes and above the ears. These are known as the paratoid glands.